I was very excited to try yes another “green” product that is safe for children. The Orange Dreamsicle Organic Baby Shampoo and Body Wash smelled just like a dreamsicle ice cream treat. And the rich lather for Sadie’s hair was a plus in my books. This shampoo and body wash contains a host of nourishment’s like, Calendula, Kiwi, and Oat combined with proteins, while cleansing your baby’s skin the most gentle way. The Bottoms Up Organic Baby Massage Oil blends Organic Sunflower Oil and Coconut Oil that are very high in essential fatty acids and help to moisturize (I even snuck some too…). It is a compliment to the Shampoo and Body Wash and is nice and light and absorbs quickly so no greasy mess. 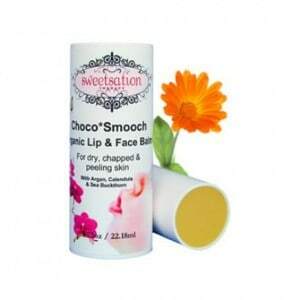 The Choco Smooch Organic Lip and Face Balm is amazing. Once you get past the chocolate craving after smelling it you will see that it soothes and protects little lips, cheeks and chins and doesn’t leave a greasy mess. Sadie calls it her lipstick. 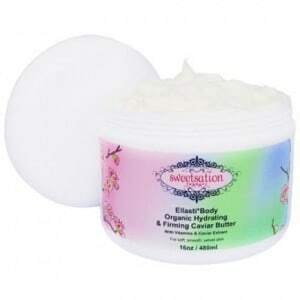 I fell in love with the Ellasti Body Organic Hydrating & Firming Caviar Butter. It is one of my favourites by far!!! The scent was nice and light so I didn’t have to worry about the many scent free zones I go too. Some of the other body butters I have tried in the past were very strong but this was perfect. It didn’t feel greasy and absorbed nicely and quickly so I could get dressed and not have to worry about getting the cream all over my clothes. It made my skin very soft. I am very happy with this product. I even let my sister try it as I am that nice. She had the same thoughts as I did and even kept the bottle…Hmmm…well…she is deserving of such a nice cream…she is carrying my niece. Sun*Si’Belle Organic Triple Action Moisturizer with SPF 30+ and Antioxidants is a sunscreen can be applied to both your face and body. I love it! It is unscented and completely non-greasy. Sunscreen has ALWAYS been sooo greasy for me with my oily skin so it was such a pleasant surprise to be able to use a product that did not make me look like a glow worm! It absorbed into my skin and made it really soft. One benefit that I found is that it really evened out my skin tone. I sometimes get blotchy and it was amazing to see how clear my face looked. I applied it after my shower but before my makeup. I used Mineral Foundation and it acted as a good base for my makeup. Plus it is also chemical free and toxin free and was gentle on my sensitive skin. Aqua*Tica Organic Botanical Night Cream is made with many natural nourishing ingredients including Sea Kelp, Spirulina, Cucumber, Argan Oil, Kojic Acid and Caviar Extract to name just a few. Read up on this product on their website to see all the other wonderful healthy ingredients. 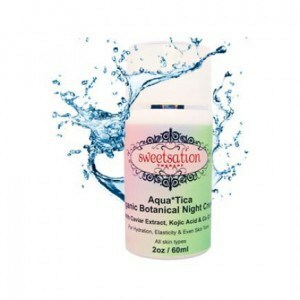 It works to provide continuous hydration to your skin while you sleep, boosts the production of collagen and elastin, nourishes with vitamins and minerals, prevents oxidation of cells and more. It also has essential oils to help you relax and sleep. It is also good for coffee drinkers (eek- that’s me!) and smokers because it restores moisture balance and repairs skin tone. Pollution and the environment is hard on our complexions. I normally don’t wear night cream because of my oily complexion, but I really liked this one. The texture was very different from any other cream I have tried. It was a whipped, light cream that does not feel at all heavy on your face. My skin drank this up and it left no greasy residue. I found the scent very soothing and perfect for bedtime.